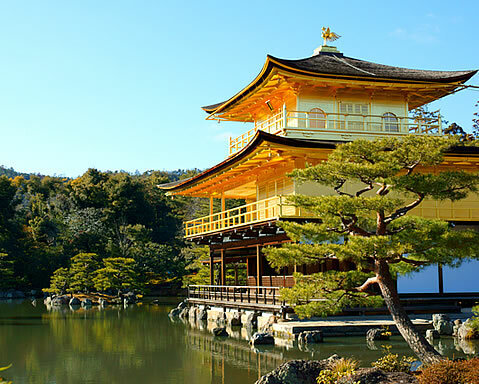 Kyoto is the soul of Japan, where arts, crafts, religious and secular traditions have been honed and perfected through centuries of practice, devotion and mutual influence. 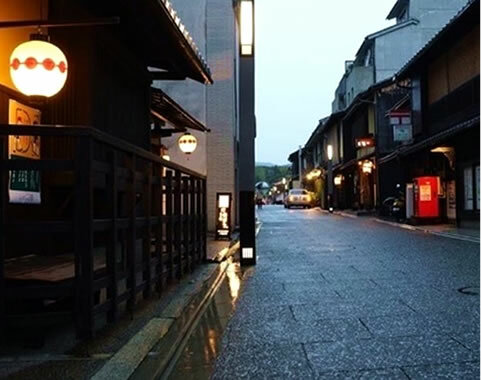 Many districts, each with their own particular origins and activities, can boast to represent the heart of the old Kyoto, and JIJUDEN is located in one of them, in the immediate vicinity of three World heritage sites. 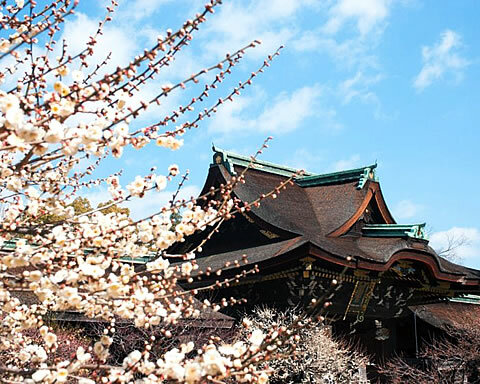 The world famous Golden Pavilion is a three minute walk away from our gates, and if you come down from there along the Kinukakenomichi street, you can visit the Zen temple of Ryōan-ji with its famed rock garden and the Shingon, or esoteric Buddhist, temple of Ninna-ji. If you like walking, you can carry on all the way to Arashiyama, and enjoy all the temples, shrines and nature on the itinerary. Even if you are not interested in Zen, the temple complexes of Daitoku-ji and Myōshin-ji are definitely worth a visit. 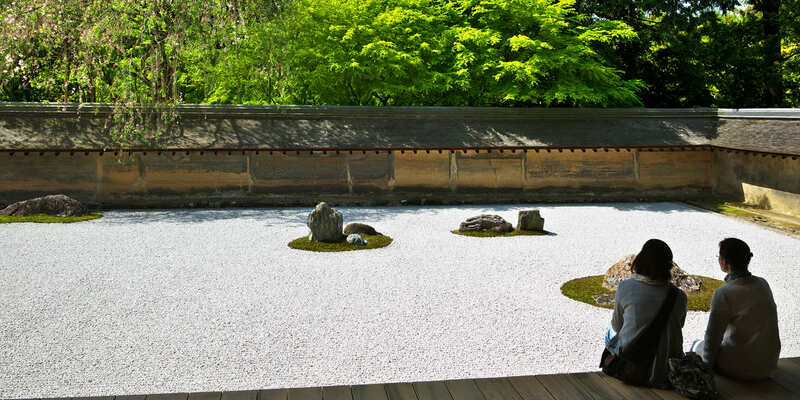 With their many sub-temples and gardens, each with their own architectural style and history, they are places where you can learn, enjoy yourself and even experience a session of zazen meditation if you wish. Both are the head temples of their respective Rinzai brand of zen, and their branch temples number the ten of thousands across the country. Cherry blossoms in spring, matured fruits in summer, flamboyant leaves in autumn, snow covered landscapes in winter. Running through the architecture, both in its concept and in its realization, is the philosophy that everything changes, nothing ever lasts and that permanence is an illusion. It is this reality that buildings in temples and shrines try to serve, respect and constantly convey. Thus, the main actor in those places is not the human mind that has thought of creation, but rather it is the lesson of Creation as impermanence that can be viewed in a falling leave, in a decaying branch, in a drop of water or in a new bud in spring. 13 mins walk/2 stops by bus. 25 mins walk/5 stops by bus. 23 mins walk/bus& Kitano Line. 24 mins walk/6 stops by bus. 15 mins walk/4 stops by bus. 18 mins walk/5 stops by bus. Originally built by Shogun Ashikaga Yoshimitsu in 1397 to serve as his villa. It remained the epicenter of political affairs until the Shogun’s death, after which it was converted into a Zen temple of the Rinzai school by his son and became known as Rokuon-ji.It is considered to be a perfect architectural representative of the Muromachi Era, and listed as one of the Historic Monuments of Ancient Kyoto, and as a UNESCO World Heritage Site. The site of the temple was originally a Fujiwara family estate. Hosokawa Katsumoto inherited the residence and willed the property to be converted after his death into a Zen temple complex. Famous for its rock garden (karesansui – or dry landscape), it is also renown for its plum and maple trees and for the water lilies. 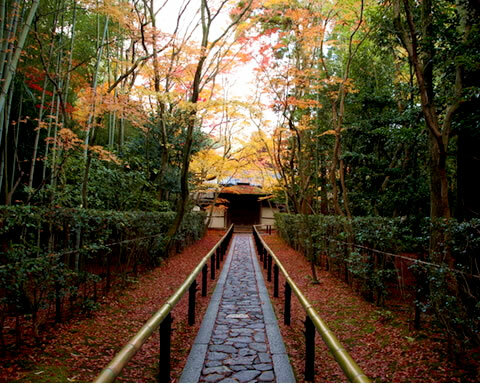 The temple and gardens are listed as one of the Historic Monuments of Ancient Kyoto, and as a UNESCO World Heritage Site. 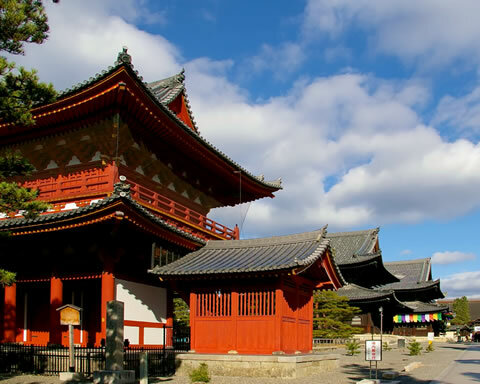 Founded in 888 on the orders of Emperor Koukou to serve as a temple for the Omuro-ha Shingon Buddhist sect, it was traditional until 1869 for reigning Emperors to send one of their sons to the temple to act as head priest whenever a vacancy arose. 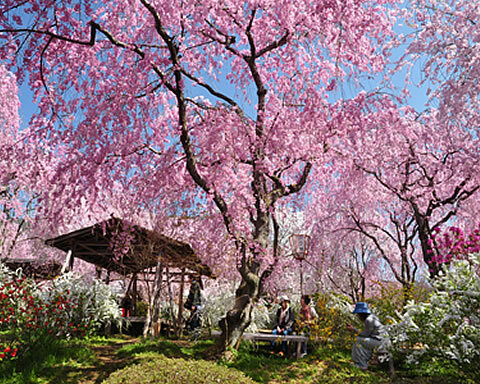 Its famous late-blooming cherry blossoms are in bloom around the 20th of each April.It is listed as one of the Historic Monuments of Ancient Kyoto, and as a UNESCO World Heritage Site. 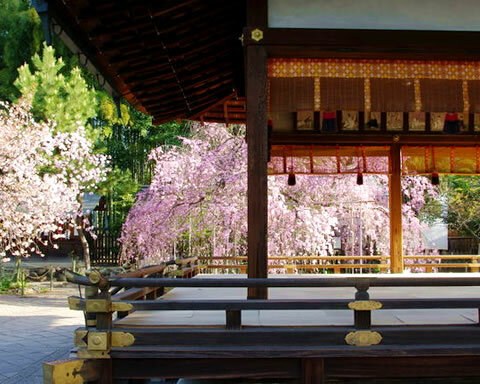 In 1337 Emperor Hanazono turned his private villa into a Zen temple, which has now become head temple of the more than 3000 temples of the Myōshin-ji Rinzai Zen school spread out countrywide. 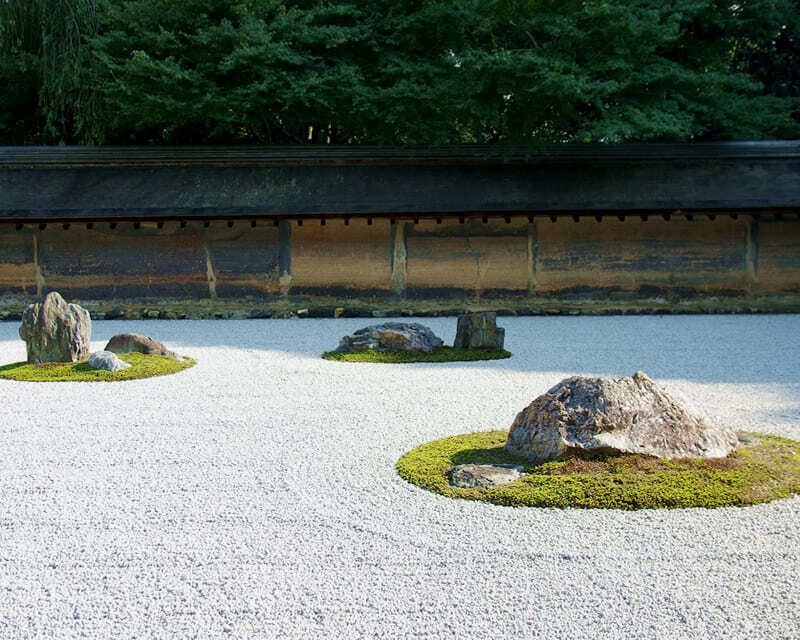 The Myōshin-ji school of Rinzai Zen Buddhism is the largest school in Rinzai Zen. All the buildings within the Myōshin-ji temple complex are typical of the Zen architectural tradition and are designated as important national treasures. 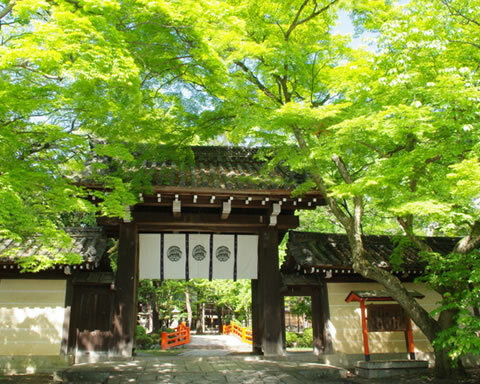 Established in 1325 and head temple of the Daitokuji Rinzai school of Zen Buddhism. More than twenty temples are found within this complex, many of which are important national treasures. The temple has produced successive generations of famous Zen masters such as Ikkyū Sōjun, and tea masters such as Sen no Rikyū who is considered the historical figure with the most profound influence on the Japanese tea ceremony. Kitano Tenman-gū is a shrine which was built in 947 to appease the angry spirit of bureaucrat, scholar and poet Sugawara no Michizane, who had been exiled on false charge as a result of political maneuvers of his enemies in the Fujiwara clan. It is now worshipped as the god of study and learning. From late-February to mid-March, the shrine is surrounded by over 2,000 plum trees planted for Sugawara, who loved the blossoms. Found in the vicinity of the above-mentioned Kitano Tenman-gū, Hirano shrine was established in 794 when Emperor Kanmu moved the capital form Nara to Kyoto. 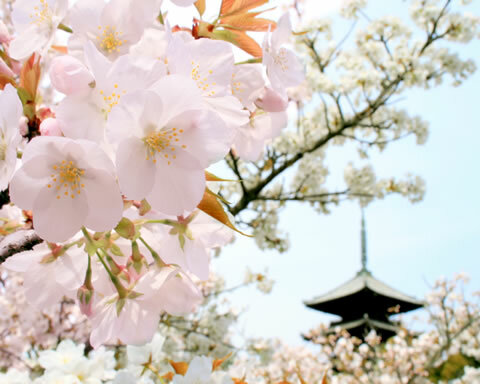 Thousands of cherry trees were planted on its ground during the following Heian Era, many of which can still be seen nowadays. Just north of the above-mentioned Daitoku-ji temple is the Imamiya shrine. One of its subordinate shrines enshrines the god of textile and is visited all-year round by the many weavers of the nearby Nishijin district, where the renown Nishijin textiles are produced. On the side of the Imamiya shrine are two centuries old shops where you can have a rest and savor their famous Aburi dumplings with a cup of tea. The oldest geisha town of Kamishichiken prospered together with the textile business of nearby Nishijin district. The origins of the place may be traced back to the Muromachi Era when the above-mentioned Kitano Tenman-gū shrine had to be rebuilt and some teahouse were made with the left-over wood. Today you may catch glimpses of geisha and maiko girls going in and out of the many tea houses and okiyas(dwelling of geisha). The works of Insho Domoto(1891-1975), the great Nihonga painter, are preserved and displayed in the museum. The museum was built in 1966 by Insho Domoto designing it all interior and exterior. Although Insho left many works of his carrer, following the various development of his painting style from traditional Japanese paintings to an abstract paintings, those continued stimulating intense for Japanese painting circles. Privately owned garden in the Haradani district in the north of Kyoto, this garden of about 1,3 hectare is where you will be able to enjoy the sight of many species of cherry trees (double-flowered, weeping, yellow, Omuro, Higan or early-flowering, etc) that are otherwise hard to find all in one place. Opened only during the season. Japanese stylish serviced apartments for people who like to stay in extended-stay hotels, holiday/vacation rentals and long-term stay accommodations in Kyoto. Address. 1 Soumon-cho, Kinugasa, Kita-ku, Kyoto 603-8363, Japan / Office Hours : Monday - Friday (except holidays), 9 am – 5 pm. Copyright © JIJUDEN All Rights Reserved.